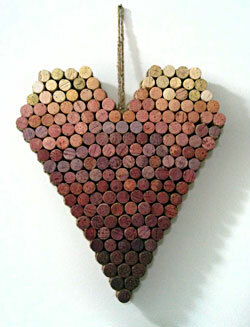 Annie puts her heart into her work - Put a Cork In It. Vancouver crafter, Annie Vandergaag, is passionate about her craft. So it’s little wonder that she puts her heart into her work. Great colour transition from top to bottom in this lovely wall hanging. The corks are bound together with hemp cord and the colour is achieved simply by grouping corks with similar natural wine staining. Annie, thanks for sharing. Cheers!